Last year, the tenant movement made headlines with a report that showed how landlords flood Albany with cash. State leaders have agreed that our elections need reform and that the loophole that allows big real estate to get around our lax laws needs to be closed. New York City is now the homeless capital of the United States. That's because Big Real Estate holds an outsized role in politics. Your organization can make that a reality: join the push. Sign on to the letter to reform elections, and go to Albany for the March 11th lobby day. The letter is posted below. To sign your organization onto the letter, contact us at jaron@realrentreform.org. Mayor de Blasio has named heads of the New York City Housing Authority, the Housing and Preservation Department, and the NYC Planning Commission. Shola Olatoye (top left) is now the NYCHA chair, and was an HSBC Bank vice president. She most recently held the same position at Enterprise Community Partners, a non-profit affordable housing organization. Vicki Been (bottom left) has been named HPD commissioner. Before the appointment, she was the director of the Furman Center for Real Estate and Urban Planning. She also has experience as a professor at NYU's Law School, and has a history of promoting environmental justice, studying the relationship between people of color, low-income tenants, and industrial pollution. IS 2014 THE YEAR TENANTS WIN RENT FREEZE? Rally on March 27 at the Rent Guidelines Board. When Bill de Blasio called for a rent freeze, some balked at the idea. At that time, most pundits felt de Blasio's only chance at becoming mayor was to force a run-off in the Democratic primary. These tenants aren't out of the woods. Real Rent Reformed helped organize a rally that garnered press attention from Newsday and News12 Long Island: Tenants of an apartment complex in Great Neck rallied today with hopes of holding onto their homes in the face of eviction. Tenants of Academy Gardens, which has 40 rent-stabilized units, say the building's owner is looking to tear it down and replace it with condo units. Some of the tenants have called their apartments home for decades. TENANTS SHUT DOWN LANDLORD EVENT Amid rumors that nearly 200 angry tenants planned to disrupt the first annual Landlord Symposium, the Barclays Center decided not to host the event for fear of "bad publicity." Met Council on Housing, the Fifth Avenue Committee, Make the Road New York, Families United for Racial and Economic Equality, Pratt Area Community Council, Picture the Homeless, Housing Conservation Coordinators, and VOCAL-NY were planning a protest. Once plans of the protest became public, LandlordsNY was told they would have to find another venue. 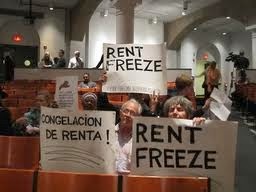 This shows that people are starting to take the tenant movement seriously again.